Now you can monitor your exhaust gas temperature without the expense of an onboard computer system or without the danger of trying to read an analog pyrometer at finish line speeds. 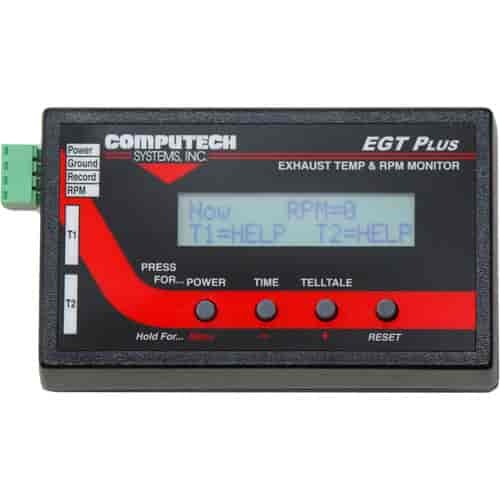 With the Computech Systems EGT System you can tune your fuel system with confidence to maintain the performance edge and consistency you need to be a winner. Professional engine builders have long utilized exhaust gas temperature readings to determine proper jetting and achieve maximum performance without the worry of being too lean and causing expensive engine damage. That advantage is now available to you also. You can also gain consistency - engines that are jetted properly will run more consistently on the track.